Hello, I just want to introduce myself as a new digital assets company KAEV that will be focused on Affinity because I just love this company so much! 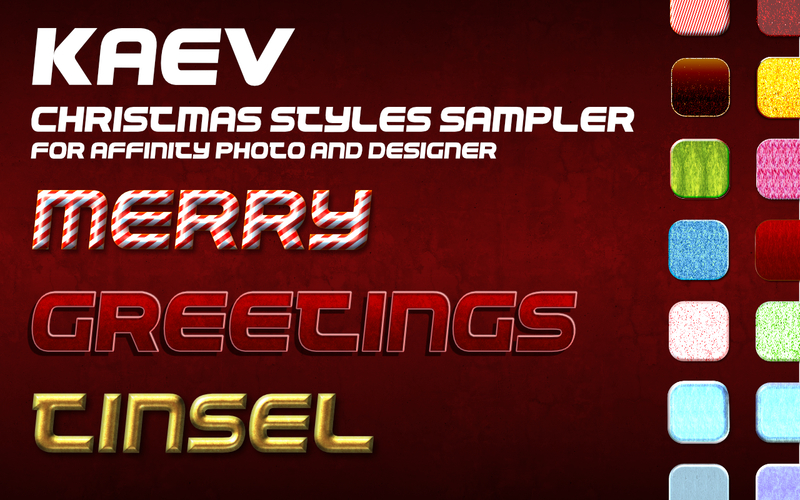 I just launched my first Christmas styles on Gumroad. This sampler is just a taste of the newly uploaded full set that I put on the store. Please check them out! A lot more planned for 2018! Here is a FREE sample of the full set! Merry Christmas!! Many thanks for the seasonal gift, Eduardo! Wonderful share! Much appreciated Eduardo. Great styles @evtonic3 Thanks for sharing the free sample. Everything working fine with payment/file download from Gumroad here. Best of luck for your new business! Thanks Miguel! I hope to spread how versatile Photo and Designer are even more! Very nice!. Thank you for sharing. Jus tto let other members know I purchased the commercial set and so Happy! Great assortment of textures! Thank you! I purchased the commercial set and so Happy! Me too. This set is much too versatile to be reserved for Christmas use! !